Fear of the dentist is real and we understand that not everyone looks forward to going to the dentist (hard to believe, right? ), particularly if you know you need dental work done during the visit. A small amount of anxiety is normal. Everyone likes to be in control and know completely each step of a process, and Dr. Jessica Emery understands that. She along with our team have worked hard to make our practice the most comfortable and welcoming dental practice in Chicago. At Sugar Fix, we spoil you with special amenities during your appointment! From being able to stream your favorite Netflix movies and shows or cozying up in a warm, cashmere blanket – we want you to feel comfortable and welcome in the practice. But we also understand there are people who never make it to the dentist, not because of the lack of amenities, but because of fear of the dentist. According to the Dental Fears Research Clinic, dental phobia, or odontophobia, accounts for between five and eight percent of Americans to avoid visiting the dentist completely, because they have a fear of the dentist. Another 20 percent stated they only go to the dentist when they absolutely must. Those are some pretty big numbers of people out there feeling just like you. Remember, you aren’t alone and we understand the anxiety can be real and scary. Why do people have a fear of the dentist? Dentistry has come a long way over the years, but a bad experience as a child in the chair can have a lasting impact. We understand that anxiety about anything unknown can ramp of feelings of nervousness. We all feel vulnerable at times, but while laying in the dental chair – it’s hard to see what is going on around us. Sadly, dental phobia can be a self-fulfilling prophecy. People with a fear of going to the dentist, often can find themselves in need of the most dental care due to lapses in visits. As we mentioned earlier, dental phobia can be a self-fulfilling prophecy. Avoiding the dentist can have long-term consequences. When caught early, tooth decay is easily stopped with a minor filling. If you let the decay go, you can end up losing your tooth and have chronic pain. A dentist can also check for early signs of gum disease, which, if left untreated, could lead to losing one or more teeth. So how can you get over your fear of the dentist? Here are a few ways you can make visiting the dentist more comfortable, easing the fears you have battled in the past. 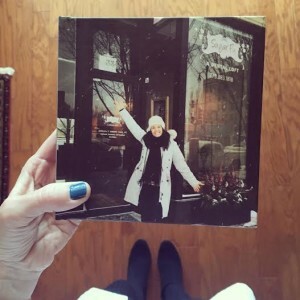 Dr. Emery “embraces” the cold in front of Sugar Fix Dental Loft. Dr. Emery is more than the face behind the mask that peeks at your teeth every six months. Getting to know that face behind the mask can go a long way to putting your mind at ease. She’s a friendly, outgoing mom to three kids – maybe, just like you! But don’t take our word for it – schedule a time to stop in for a few minutes and meet our team before getting treatment. When the hygienist or dentist knows your fears, they can be sure to take those fears into consideration during the appointment. 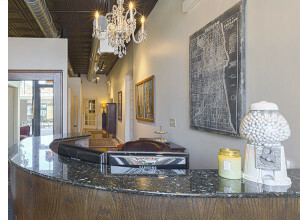 Our reception area at Sugar Fix Dental Loft in Lakeview. Not every dental procedure must be the same for each person. Say you have a sensitive gag reflex that makes you dread getting X-rays. Talk to your dentist about your concerns. Perhaps you can get panoramic X-rays instead, which are less likely to make you gag. For some, no matter how hard they work on their fear of the dentist, nothing seems to work. Next week in our blog, we’ll talk through sedation dentistry and how that may be an alternative for combatting dental phobia and anxiety. Using a safe and effective, FDA approved method that leaves you with little or no recollection of treatment, Dr. Emery and her team can tend to dental issues and procedures. To discuss your fear of the dentist, or to make an appointment to meet Dr. Jessica Emery and her team before your treatment – call us today at (773) 883-1818.